I have started work on the colony development features. 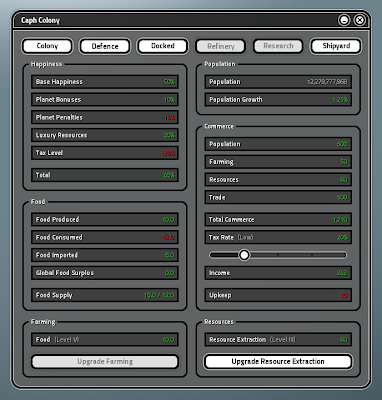 This is a screenshot of how the colony interface screen currently looks. I will go into each catagory in more detail, but I am hoping most of the values are quite self explanatory. In the game you can hover over each of them with the mouse to display tooltips with a full description and breakdown of how the values are calculated. The buttons along the top are used for navigating to the different pages. The maximum population values still need some adjusting. I havnt much of an idea how many people ice, ocean, carbon and iron planets could realistically sustain for example, assuming the advanced technology was available. Most commerce and income from a planet will come from a high population. But it will take quite some time for them to grow to the maximum it can sustain. Still unsure of how conquering planets will work exactly and whether the existing population gets eradicated, integrated into the conquering faction or something else entirely. There wont be troop invasions or ground battles. For every 1 billion of population, the colony will require a single unit of food. If it doesnt have the required amount then the population will shrink. Having more than is required increases the rate at which the population will grow. Excess food produced at a colony gets added to the global empire-wide surplus value and then is imported at colonies which have a shortage. Any remaining surplus food available is spread evenly between all colonies to increase their population growth rate. Happiness level determines the chance of revolt and has a big effect on the population growth rate. Even if you have enough food available, the colony wont grow unless the population is happy. There are lots of planet bonuses/penalties that can affect happiness, such as meteor showers, acid rain, seismic activity, planetary rings and many others. If the happiness level goes below 0-25% for too long it will risk triggering a rather nasty revolt penalty at the colony which lasts for some time. There probably wont be a feature where you can lose control of the colony to a revolt or rebellion however. Will maybe be added in a future update/expansion. Colonising a planet which has a trade resource gives a happiness bonus to all colonies in your empire and a big boost to commerce at the planet, depending on which resource it is. Access to more than one of the same resource can be traded away to other empires and used in diplomacy. Having access to all of the luxury resources will provide a significant boost to happiness and population growth rates. Commerce at the planet mainly comes from a high population or having access to valuable trade resources. Small amounts are generated from farming and natural resources, but these are more helpful during the early stages of colony development. You can change the tax rate at each colony, which will determine the percentage income you receive from the total commerce value. Setting it too high will decrease happiness which results in lower population growth rate and increased risk of a revolt. Colony income is added to the empires total credits (per second) Ships will also now have an upkeep cost rather than using the supply depot facilities briefly mentioned in an earlier post. Going into negative credits for too long will trigger a bankrupt penalty for all colonies and will be extremely damaging to your empire. Colonies on the easily colonisable planet types will cost the less to support while the more hostile environments such as volcanic, iron and carbon will be a lot more expensive. You can only build and upgrade farming on barren, temperate, ocean (fisheries) and jungle planet types. Each can produce varying amounts, jungle being the highest. To produce food on the other less hospitable planet types you need to build Hydroponic facilities. These will use up valuable colony building slots. Developing dedicated farming colonies will be a good strategy. These are not metal resources that you can use to build things, but natural resources which benefit commerce and increases the planet income. Resource rich planets like iron, carbon and volcanic will have the highest values. With the addition of food and trade resources as well as the modules, ore and metals from mining I'm starting to distance myself from the earlier idea of having everything needing to be transported by ship rather than getting added to a hidden global resource pool as in most RTS games. Its possible that it could get too complicated or annoying to manage ship transport and getting the AI to do all of it intelligently could be difficult. This isnt an announcement that I'm removing the transporting resources feature, just that I have concerns with it and may ultimately be changed once its been tested with everything else working together. However I will do my best to try keep the feature as I really like it. There is still some work to get colony development properly implemented so let me know if you see any obvious problems or feedback you might have. You can now also follow the development of Galaxial on Facebook where I have created a page. Having resources needing transportation is much more interesting than magical resources pool. With cutting of bit afther bit of former, more complicated ideas (many planets per system for example) game starting to look as a shadow of what primarly it was planned to be. With lack of transportation many interesting strategies will be impossible or will be looking very silly - for example trying to blocade enemy planet from supplies, so it will be unable to grow and build new ships. Sure - it can be done in a way so if You do not have any military ships in planet orbit, and enemy have them than planet is blocaded. But it would be very silly - how it can be blocaded if resources are magically teleported from one place to other in a blink of eye? Other nice tactick is to pirate enemy supply and trade routes. Again - without real resources transportation this will be also impossible or will be silly symbolic (wheter You have somewere Your units or not). Of course game still will have part of it's potential. And it will be easier to do also. So idea of magically teleporting resources do have it's advantages, and I am not going to lie that id does not. It just does not sound interesting at all and is just another simplicity towards RTS like playing style, not 3 or 4X game. Even Sins of Solar Empire did some kind of transportation (quite pathetick if You'd ask me, but good eoungh to make at least piracy good strategy to gain some easy cash). There is a 4X game which is doing very good when it comes to resources and population transportation which is called Distant Worlds. It is not bug free, and for sure not problems free but defienietly it is currently best example of how important transport is, and how fun game mechanic it can be (and how annoying sometimes - I would never ever said that it does not have it's bad sides). I hope that most peoples will agree with my comment, but I am affraid that I belong to very small minority which is too small to have any impact on how things will develop. Also to not be understanded in wrong way - I am not saying that Galaxial should aspire to Distant Worlds. I have only showed this as a proof that interesting resources transportation may be done - nothing more than that. I updated the wording in the post slightly, as it wasnt meant to intend that the transporting has been removed. Just that I have some concerns with it. I really like the idea and will do my best to keep the feature, but if its simply not fun once everything else is finished then it will most likely be removed. I really enjoyed this aspect of The Settlers II (and even more so in the 10th anniversary version of the same game). Admittedly, it was more of an economic management game but I thought the mechanic of actually moving resources around and waiting for things to move to your frontiers (and moving round associated production buildings to increase speed, with the increased threat of losing them) was a good mechanic. Distant Worlds is a great example too (and a great game!). Hmm, Happines, Political influences? It starts to get over complicated in my opinion. Why not keep it in MOO style? The idea of transporting goods is cool. I've told you in previous post, that you should really use LUA for all those things. It will shorter development time and will build huge MOD community..
Colonies wont require a lot of micro-management, thats something I would like to avoid. I'm more in favour of a balanced transport system where the important resources such as ore, metals and research data will require transport by ship as there will be less complicated routes for these. Where as the credits, food and trade resources will use the global pool system. Please release another video, the last one is like an year old. There will be more as the game gets closer to release. I am still constantly adding/removing new features at the moment, so to get everything prepared for a new video takes up a lot of development time. I really hope you keep harvested resources confined to the storage space provided in resource class ships rather than some imaginary supply that can be drawn from no matter where your ships are in the galaxy. As the first poster commented, this ads an incredible amount of logistics strategy to the game, and it will set your game apart from every other run of the mill space RTS. I absolutely love the thought of a stranded group of ships that ran out of fuel and then returning them to the fight by sending in refueling ship. This type of game play would not be possible with a global resource supply.